Pendulum Effect: You can reduce the battle damage you take from an attack involving a Pendulum Monster you control to 0. During your End Phase: You can destroy this card, and if you do, add 1 Pendulum Monster with 1500 or less ATK from your Deck to your hand. You can only use each Pendulum Effect of "Odd-Eyes Pendulum Dragon" once per turn. This monster is the cover card of Duelist Alliance and Structure Deck: Master of Pendulum. This is the first cover card in the TCG since Light of Destruction to be printed as a Secret Rare. This is the first cover card monster since Photon Shockwave Galaxy-Eyes Photon Dragon that does not normally fit in the Extra Deck, though it can exist on top of the Extra Deck due to how Pendulum Monsters work. This monster is the signature card of Yuya Sakaki. In the anime, this card is the transformed version of Odd-Eyes Dragon after it reacted with Yuya's pendant. This monster's eye colors are based on Yuya's hair colors. It shares the same ATK of 2500 as of the other signature cards: Dark Magician, Elemental HERO Neos, Stardust Dragon and Number 39: Utopia. These monsters are respectively the signature cards of Yugi Muto, Jaden Yuki, Yusei Fudo and Yuma Tsukumo, the previous protagonists from the first four series of the anime also with Firewall Dragon the signature card of Yusaku Fujiki , the next successor of the anime. This monster's Attribute and Level are the same as Yugi Muto's Dark Magician: a Level 7 DARK monster. This card also marks the first time in Yu-Gi-Oh! where the protagonist has a (Something)-Eyes (Something) Dragon Dragon monster as their signature card instead of their rival, like Blue-Eyes White Dragon or Galaxy-Eyes Photon Dragon. This is the first protagonist ace monster to have an offensive effect rather than a defensive one, like Stardust Dragon and Number 39: Utopia. It does have a defensive Pendulum effect however. Like how its counterparts are a reference to their owner's origin, Odd-Eyes represents Z-ARC's entertaining spirit, which is reflected by Yuya's ideal. As a Pendulum Monster, it is the first signature card of a main protagonist that can exist in both the Main Deck and the Extra Deck. According to Zuzu Boyle, this card represents the courage Yuya inherited from his father (adoptive actually). This card continues the trend of card names which included Red-Eyes B. Dragon, Blue-Eyes White Dragon, Galaxy-Eyes Photon Dragon, Number 107: Galaxy-Eyes Tachyon Dragon and Googly-Eyes Drum Dragon. This card is one of the first monsters to be Pendulum Summoned in the Yu-Gi-Oh! ARC-V anime, along with Performapal Whip Snake and Performapal Sword Fish. This card is the first Pendulum Monster Yuya set in a Pendulum Zone that wasn't a Magician Pendulum Monster. This card also has a manga counterpart: Odd-Eyes Phantom Dragon. Their effects mirror each other; while both of their Pendulum Effects activate when a Pendulum Monster battles and the regular effect deals additional damage while battling, the actual functions of their effects greatly contrast each other. True to its counterpart status, Odd-Eyes Phantom Dragon has its body mostly blue while most of the body of Pendulum Dragon is red, making these 2 monsters represent opposite sides of the Pendulum Scale. This card has several Extra Deck counterparts, hybrids, and evolutions. 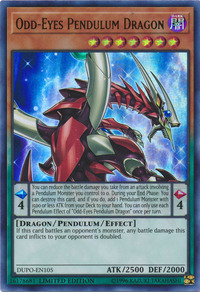 Xyz Pendulum: Odd-Eyes Raging Dragon & Odd-Eyes Rebellion Dragon (both w/ Dark Rebellion Xyz Dragon). Fusion: Beast-Eyes Pendulum Dragon, Brave-Eyes Pendulum Dragon, Odd-Eyes Vortex Dragon, Performapal Odd-Eyes Metal Claw, & Rune-Eyes Pendulum Dragon. This monster appears in the artworks of Odd-Eyes Fusion, Odd-Eyes Accel, Odd-Eyes Fusion Gate, Odd-Eyes Synchro Gate, Odd-Eyes Xyz Gate, Spiral Flame Strike, and Supreme Rage. An outline of this monster's head appears on the ground in the artwork of Performapal Dramatic Theater. This monster has several distinctions from the other Four Dimension Dragons. It is the only member to have a downgraded form (Odd-Eyes Dragon). It is the only member whose corresponding dimension was not initially named after its Summon mechanic, though it later became the Pendulum Dimension after Z-ARC is defeated. It is the only member without wings, making it a pure land-based monster. It is the only member to start in the Main Deck instead of the Extra Deck. It is the only member that cannot boost its own ATK. Instead, it boosts its battle damage. Among the Four Dimension Dragons, this card has the least amount of owners with 2. "You can reduce the battle damage you take from a battle involving a Pendulum Monster you control to 0." effect does not start a Chain Link. "destroy this card" and "add 1 Pendulum Monster with 1500 or less ATK from your Deck to your hand." are considered to happen simultaneously.